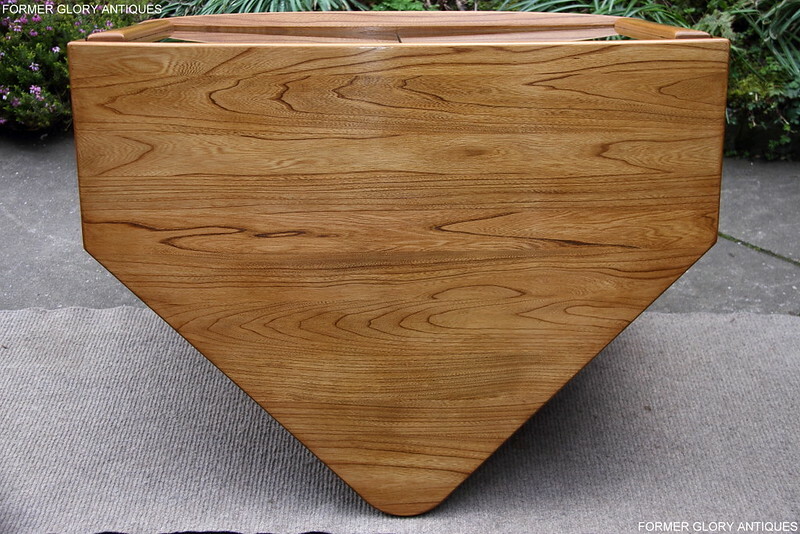 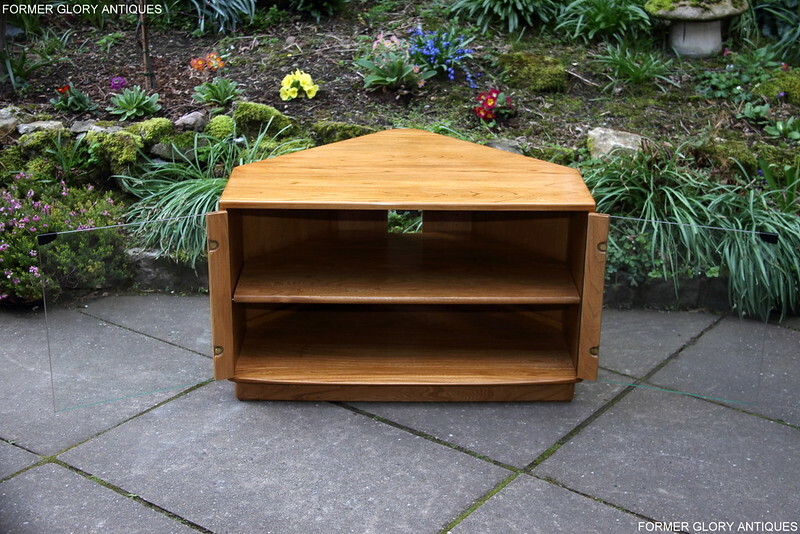 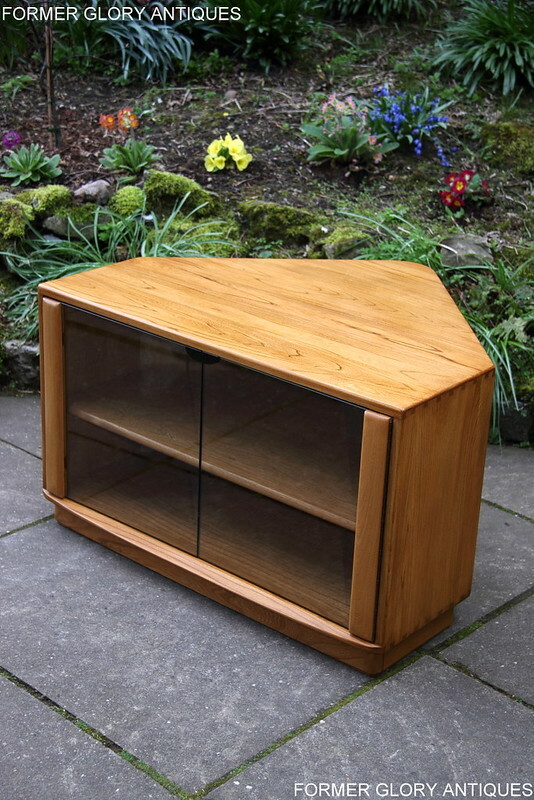 AN 'ERCOL' 'WINDSOR' 'LIGHT ELM' CORNER TV CABINET / HI-FI STAND. 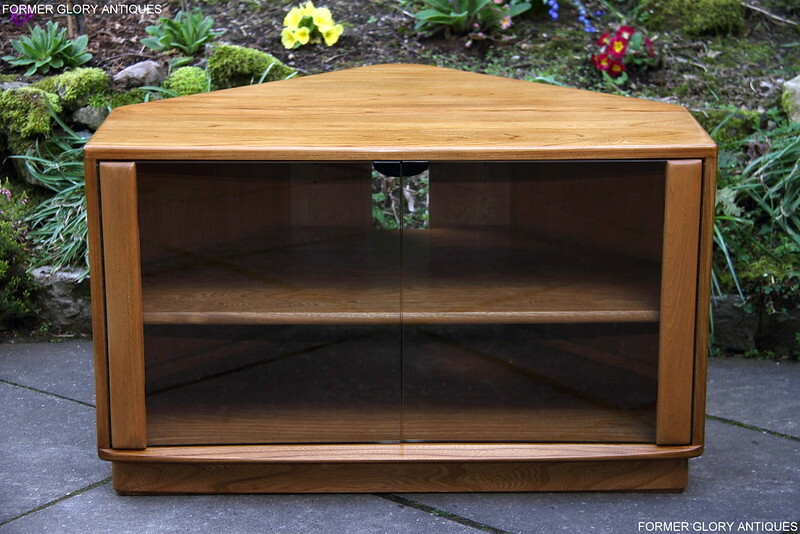 A VERY ATTRACTIVE, EARLY 21st CENTURY, SOLID ELM, CORNER T.V CABINET, OF EXCEPTIONAL QUALITY AND CONDITION. 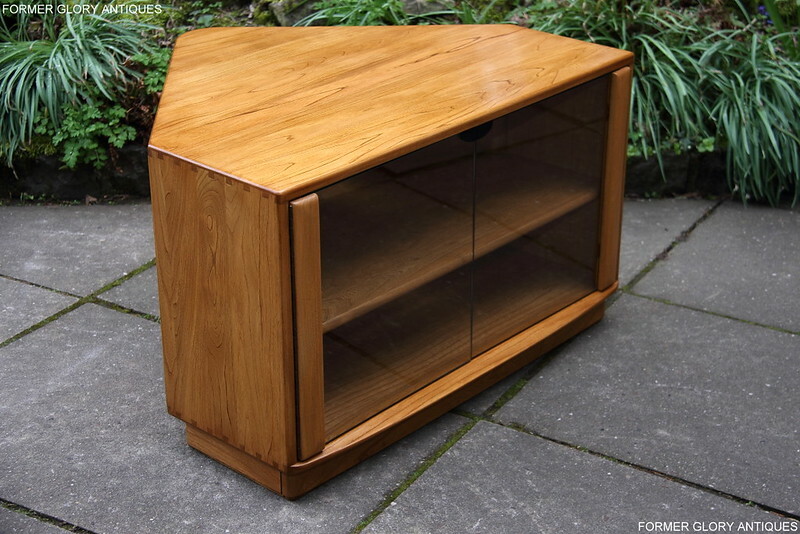 THIS FABULOUS CABINET IS MADE BY ONE OF THE LEADING FURNITURE MANUFACTURERS IN TODAY'S MARKET PLACE. 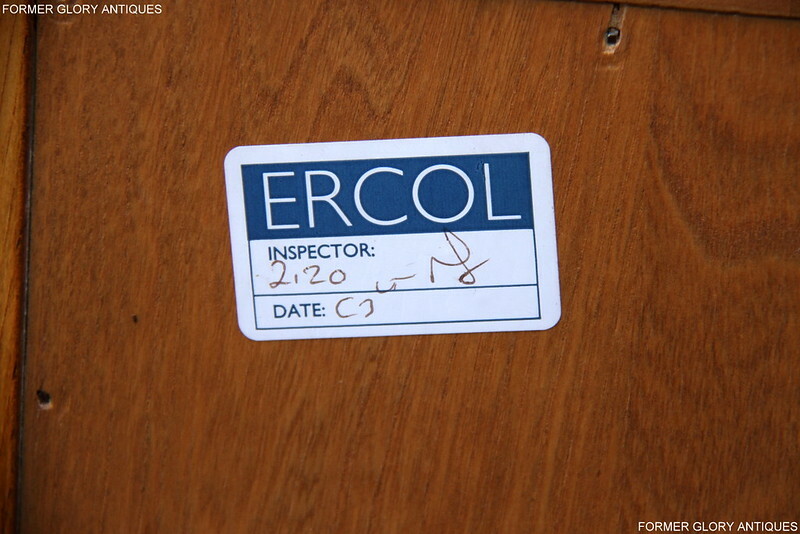 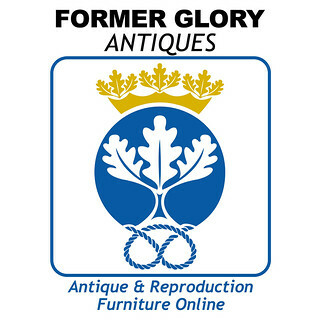 IT IS THE FAMOUS 'ERCOL' FURNITURE COMPANY, OF RISBOROUGH, BUCKINGHAMSHIRE, ENGLAND. 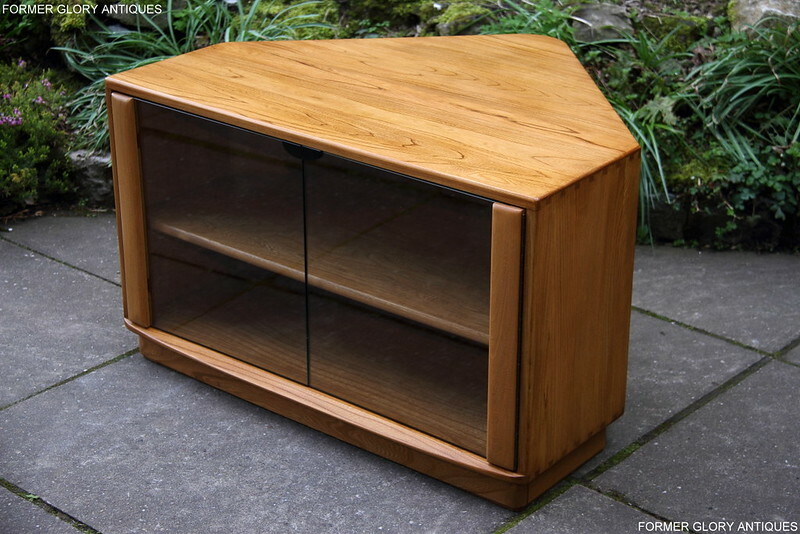 THE CABINET IS PART OF THE VERY POPULAR 'ERCOL', 'LIGHT ELM', 'WINDSOR RANGE', MODEL No.2120. 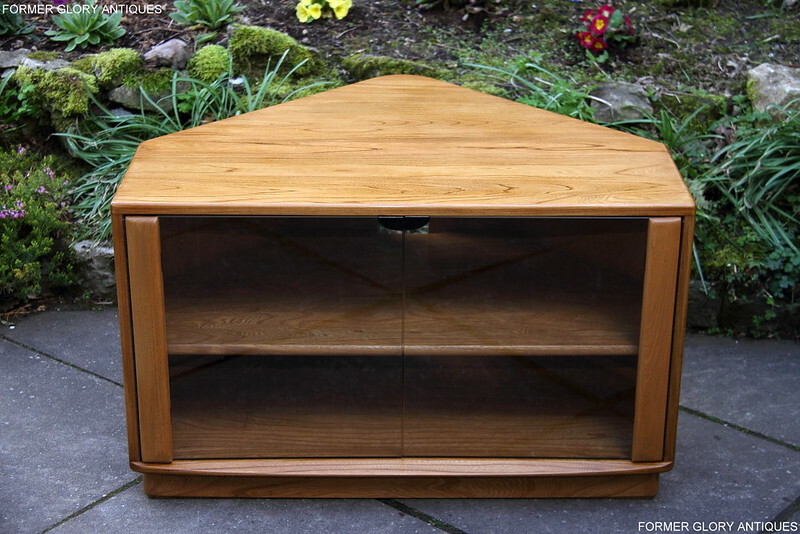 IT HAS ATTRACTIVE ELM-WOOD GRAINING THROUGH-OUT AND WOULD SIT NICELY WITH OTHER MATCHING 'ERCOL' ITEMS OF FURNITURE. 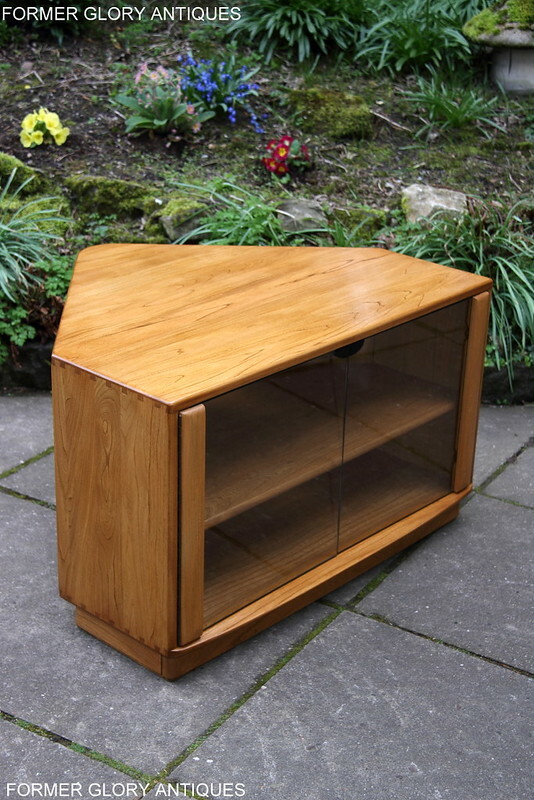 THE CABINET HAS A FIXED, SPACIOUS, FLAT ANGULAR TOP, IT HAS DECORATIVE ROUNDED EDGES, VISIBLE PRECISION CUT DOVE-TAILED CORNERS AND IS IDEAL FOR A FLAT SCREEN TELEVISION TO STAND ON. 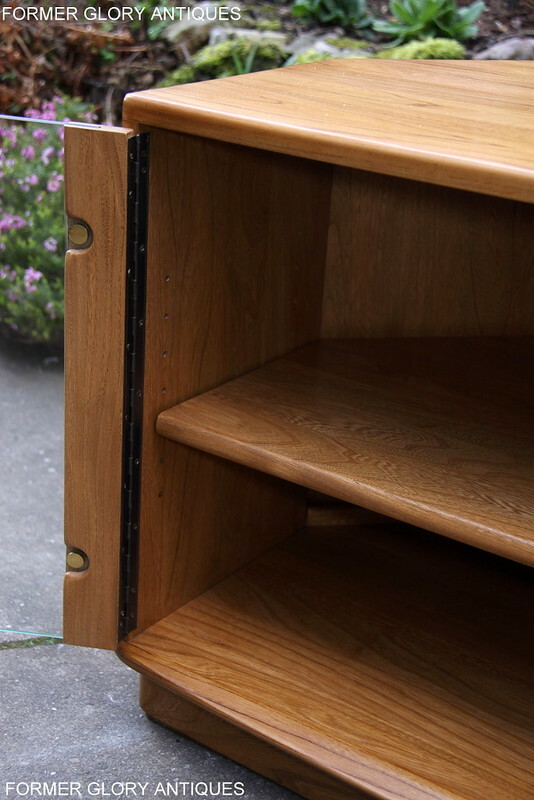 THERE IS A USEFUL TWO DOOR CUPBOARD SECTION AT THE BASE, WHICH HAS TWO, LARGE ADJUSTABLE SHELVES INSIDE, WHICH PROVIDE ADDITIONAL STORAGE SPACE FOR DVD / SATELLITE EQUIPMENT ETC. 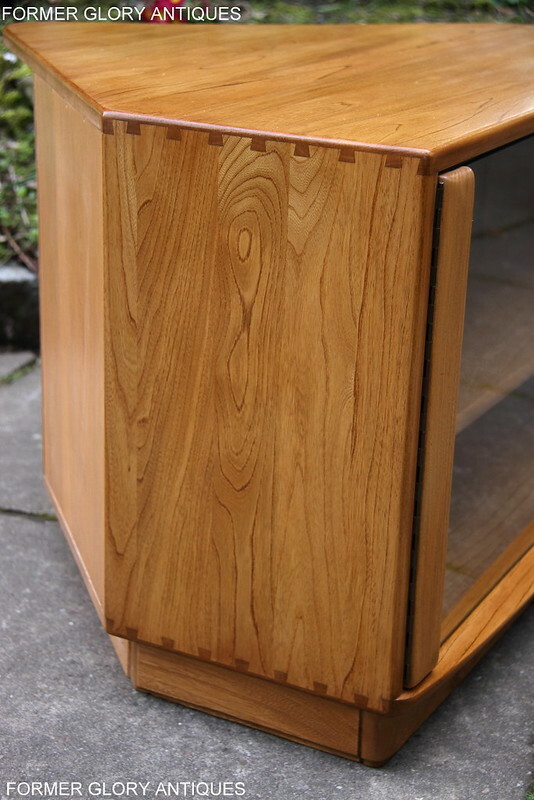 THE DOORS HAVE SOLID ELM 'STRIP' FRAMES, WITH INSET GLASS PANELS AND THEY ALSO RETAIN THEIR VERY STYLISH MAGNETIC, 'PUSH-RELEASE' DOOR CATCHES. 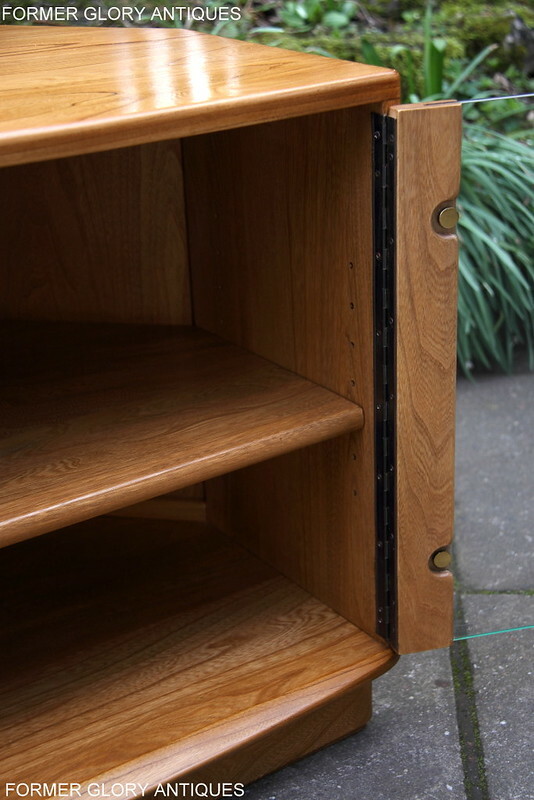 THE CABINET HAS A CUT-OUT SECTION IN THE BACK, FOR EASY ACCESS TO CABLES / WIRES ETC AND THERE IS DEEP FRIEZE AT THE BASE OF CABINET, WITH A DECORATIVE MOULDED STRIP ABOVE. 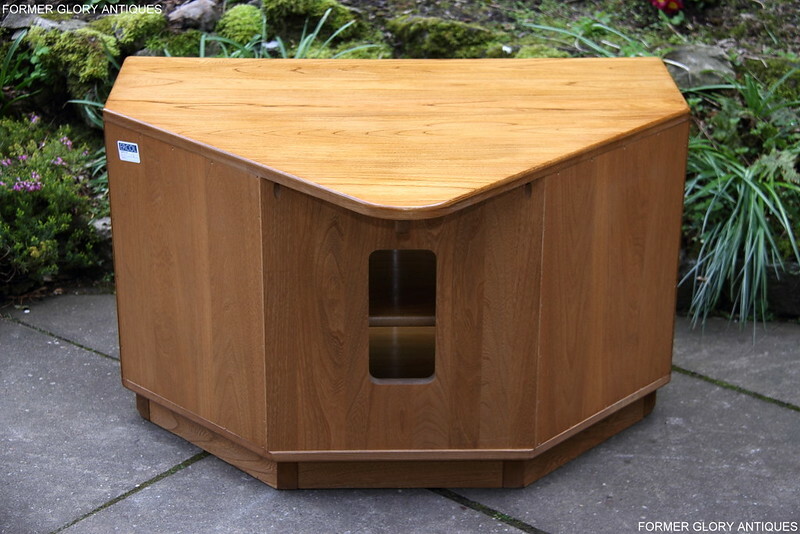 THIS SUPERIOR QUALITY 'ERCOL', 'WINDSOR' 'LIGHT ELM' CORNER T.V. 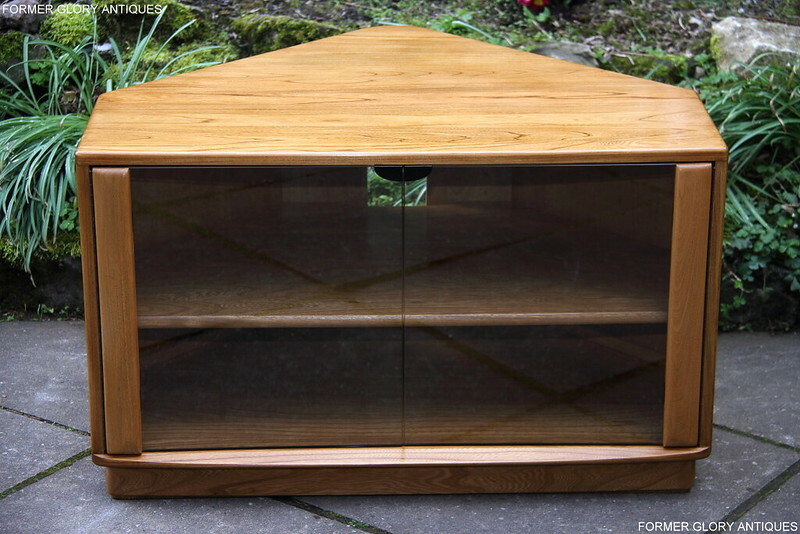 CABINET IS IN EXCELLENT / NEW CONDITION THROUGH-OUT. 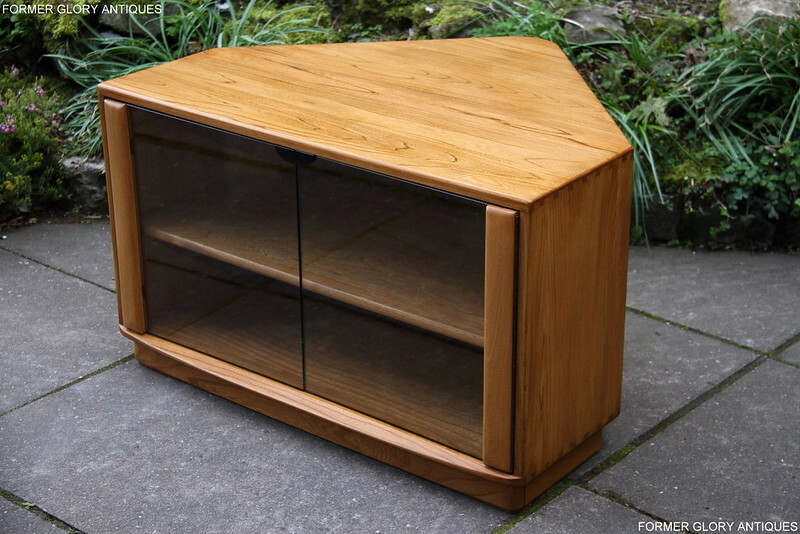 IT HAS BEEN CLEANED, RE-POLISHED AND WOULD BE A VERY USEFUL AND ATTRACTIVE ADDITION TO ANY HOME. 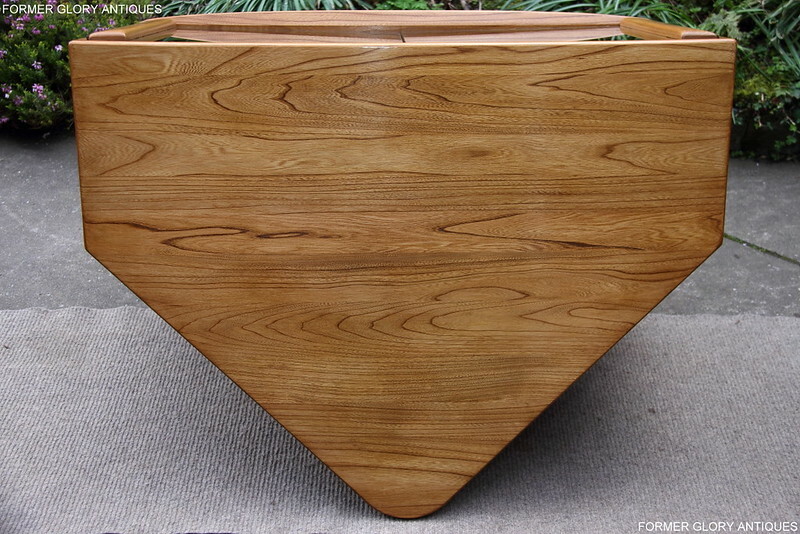 HEIGHT 21 5/8", WIDTH 36", DEPTH 28".